Ads by Cinemax may be disturbing, unreliable and dangerous. Unfortunately, it is unlikely that you will be able to avoid them if the program published by SBG gets infiltrated onto the Windows operating system. So far, as our malware experts indicate, the program is compatible with Mozilla Firefox and Internet Explorer browsers only; however, sooner or later other browsers could be affected as well. 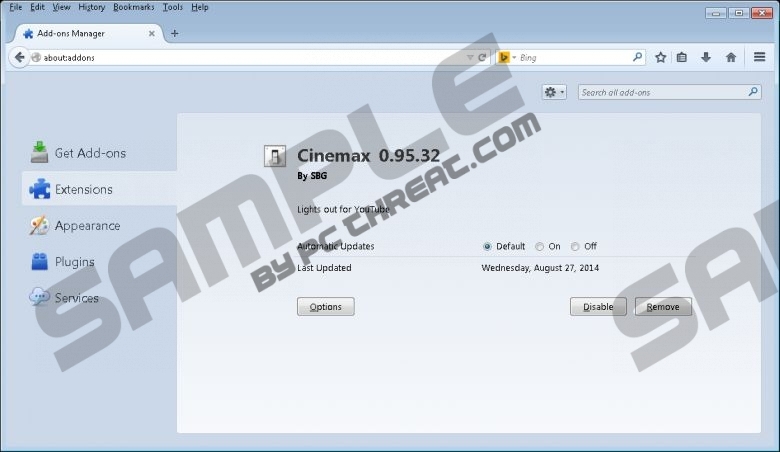 All in all, regardless of what browsers you need to delete the application from, we can help you with Cinemax removal. Most are surprised to discover Ads by Cinemax. Even though the application is not distributed silently, it is meant to dim the lights when watching online videos, and not display random advertisements. It is unfortunate but other advertisement-supported programs, like Move Mode, TV Wizard or TV Genie, are promoted in the same manner. Even though the promised services may appear to be great, you certainly should remove these programs from the operating system. These programs require removal because they work hand in hand with potentially unreliable third-party advertisers. At first, the displayed ads may seem interesting, and you may click on them. This is a mistake you should not make. Any click could be detrimental to your virtual security. Unfortunately, you will delete Ads by Cinemax only if the advertisement-supported program responsible for them is removed as well. Note that additional advertisements could be linked to additionally running adware. Since Cinemax is distributed bundled with third parties, unreliable software could be dropped onto the computer simultaneously. You have to remove these unreliable, mischievous applications as soon as possible. As mentioned already, in order to remove Ads by Cinemax, you have to delete adware. Our researchers warn that if you choose automatic malware removal software, the program may be identified as the potentially unwanted program Crossrider. Crossrider is a platform for software distribution, and it has been used to create plusHD, HQvideo, and similar software that you should delete. You may also be asked to remove Adware Helpers. This is a term used to identify certain adware files. If you want to delete Ads by Cinemax quickly and successfully, but you do not have much experience, we recommend automatic malware removal software. More experienced users, who know how to locate and remove additionally running malware, can choose the manual removal option represented below. We welcome all questions regarding adware and virtual security, and if you have any – post them in the comment section down below. Navigate to the Task Bar and click Start. Open the Control Panel and go to Uninstall a program to find the installed software. Right-click anywhere on the screen and select All apps. Quick & tested solution for Ads by Cinemax removal.